KoopaTV: Phoenix Wright: Ace Attorney — Spirit of Justice Release Date! 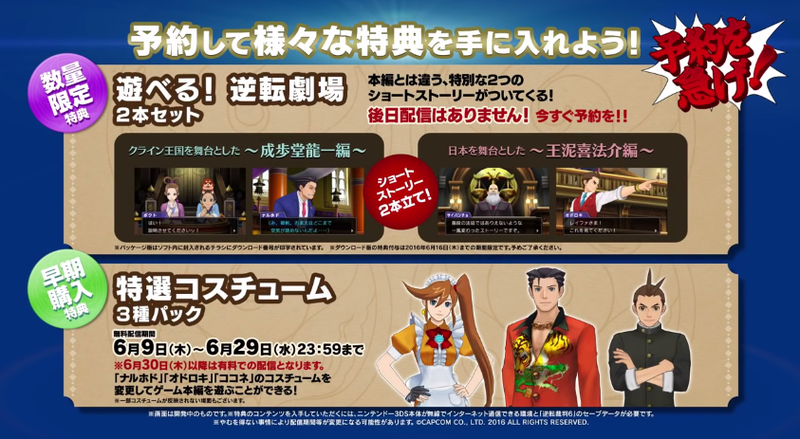 Phoenix Wright: Ace Attorney — Spirit of Justice Release Date! By LUDWIG VON KOOPA - ...Oh, and that name itself is new. Plus, eShop sales. I'll declare this now: If your name has an apostrophe in it, you're never going to even get nominated for KoopaTV's Game of THAT Year Best New Character award. So hopefully not every new character and place has one of those. The logo for Phoenix Wright: Ace Attorney — Spirit of Justice is better than the logo for Gyakuten Saiban 6. By the way, this will be the third Ace Attorney game with the word Justice in the title. Spirit of Justice joins Justice For All and Apollo Justice. I recommend that CAPCOM consult the thesaurus. The game will come out in Japan this June 9, 2016. That's super soon! It also means that it's only going to take around three months for non-Japan to get the game. That's really fast, AND efficient! Can't wait for September? Well, Phoenix Wright: Ace Attorney Trilogy and Phoenix Wright: Ace Attorney — Dual Destinies are on sale at the Nintendo eShop right now until May 18! Phoenix Wright: Ace Attorney Trilogy is $17.99, or 40% off, while Dual Destinies is $14.99, or 50% off! These are the best prices we've ever seen on these games, and I've been mentioning sales on these games in KoopaTV articles whenever they happen. This appeared at the end of the "final" Japanese trailer. I know that the costumes at the bottom are DLC! It's waitress from Trés Bien for Athena, Furio Tigre for Wright (!! ), and Phoenix's ancestor from Dai Gyakuten Saiban that never got released here for Apollo. The base price for Phoenix Wright: Ace Attorney — Spirit of Justice will be $29.99, like the other Ace Attorney games. If you're a sucker enough to be using other currencies, here they are: £24.99 / €29.99. If you're not in Japan, it's digital-only. 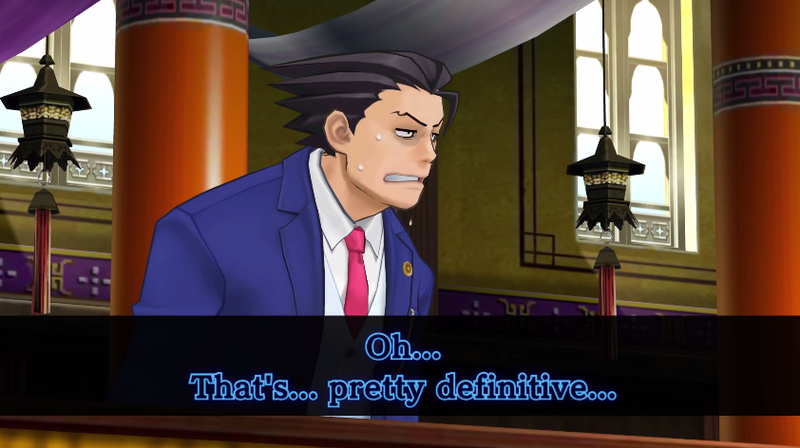 Phoenix Wright reacting to Rayfa saying the last thing the victim saw was the boy bringing down his weapon. After Phoenix Wright admits it's definitive, it cuts to a montage of pictures/small clips. What, no turnabout? You're just going to stand there and sweat in defeat? That's not really showing Phoenix Wright well, CAPCOM! The victim looked down at Ahlbi's...skirt, and then up at its face, and it remembers BOY'S VOICE? Surely Phoenix Wright could have come up with that in the trailer? 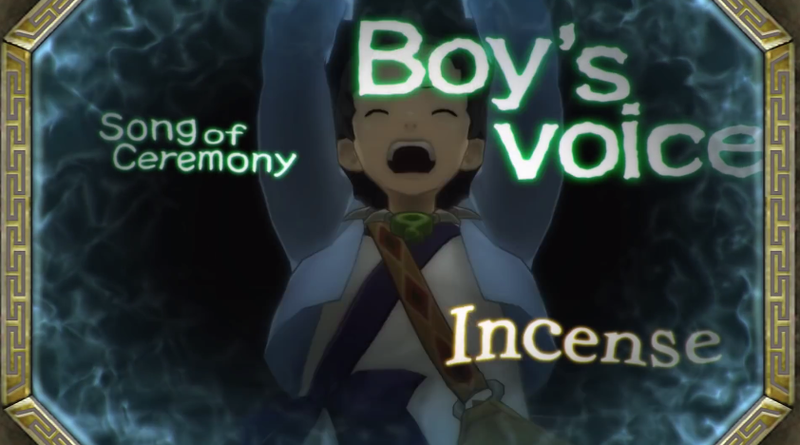 Well, we'll see what he actually does in the real trial, this September. I'll sure be buying it. You should, too. The Ace Attorney series is what made KoopaTV even possible. Ludwig always recommends it. He apologises that he hasn't been strictly using KoopaTV's airwaves for the soonest possible announcement of new news in the series, but last week in particular was just too full. For more information about how Abraham Lincoln feels about Mary Lincoln, play Capture the Confederate Flag! There's an optional line of dialogue about her. If you need some additional convincing to pick up Phoenix Wright: Ace Attorney — Dual Destinies, though you shouldn't, then read Ludwig's review of it here. Thanks to the renovated Nintendo digital game store, you can buy the Ace Attorney games right from your computer! That store allows you to buy M-rated games if you're below 17. PLUS, Spirit of Justice now has an actual day of release, not just a month. Ludwig tried pointing out the Boy's Voice thing as a contradiction, and he got penalised by the Judge. The game has released September 8, and of course you should get it. He doesn't look at all like a girl to me... I saw the confusion with Nayuta, but not Ahlbi. You already ripped me on this in September 2015. But... I feel an obligation to my sense of unethical, corrupt videogame journalism to not admit I was wrong! Is the rest of Steins;Gate like that? Like it in what way? It can be goofy like that, but it's also pretty serious sometimes. Would you have any recommending regarding it? I'm still in the middle of it, but so far I like it a lot. It gets pretty interesting, it has some very funny moments, the protagonist is endearingly crazy, and it's fun as long as you know you'll mainly be reading. With how highly-praised Steins;Gate is, I doubt it'll pull a Zestiria, but okay. I'll review it once I'm finished, too. Okay. I'LL LOOK FORWARD TO IT. Edit: I retroactively gave you a Truth point for 5/21/2016. I'm going to play through the previous 5 entries and maybe wait for it to go on sale like the others. I would prefer to buy a physical copy, but it seems like those days are long dead and gone, unless of course Limited Run Games gets a hold on them. Hehe... Guess I didn't mention in the article that this is going to be digital-only. That'd be one too many complaints. ...Eh, I better go add that in. So you're anticipating Spirit of Justice will also get the on-sale treatment? I'd note that these sales wouldn't be happening/wouldn't be applied to retail physical copies if they simultaneously existed.